Two weeks ago, I was a smug holiday return. You know the type. White clothes to show off even brown tan. New accessories acquired from tribal villages in far flung places. Delirious, inexplicable happiness etched on ageing face.I am happy to report that seven days of hayfever, two client deadlines and one narrow escape from missing cleaner incident later it has been well and truly been knocked out of me. This is where I start ranting about the injustice of the London Underground. Or - God forbid - start sharing my 4000 holiday photos. I'll just stick to sharing a recipe from my travels with you instead. 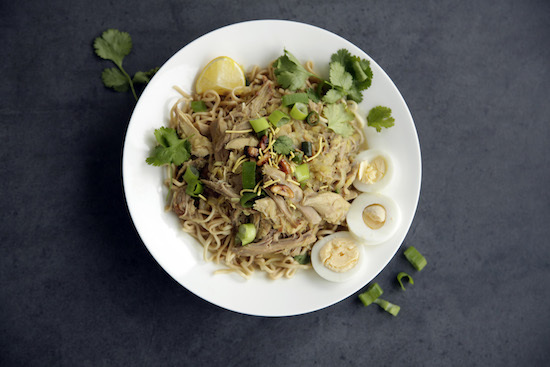 The dish is Khao Swe (pronounced Sway) - a Burmese soup noodle dish topped. I grew up on this in Kolkata, where owing to trade links to Burma, every family had its own recipe that was the subject of much competition and pride among the aunties. Up in Chiang Mai, I tried the Thai version. Traditionally cooked with chicken, Khao Suey is a coconut curry topped with a selection of fresh herbs and spices. All added in the quantities you want from little bowls on the table.This dish makes great party food. Mainly, because you would have to be nuts to chop all the garnish ingredients for the two of you.I cooked it for Aunt Madge and her boyfriend. They ate loads. Spilt it down their sweaters. And looked deliriously, inexplicably happy.Something to beat the holiday blues too perhaps? First make the soup. Chop the ginger, garlic and green chillies and bring the tablespoon of oil to heat in a large pan over a high flame. Wash the lentils thoroughly and leave them to sit in a sieve. When the oil is hot, fry the onions for five minutes until they soften and turn translucent. Then add the garlic, ginger and green chillies and fry for another five minutes. Now add the spice powders, green chillies and the chicken. Seal the chicken on each side, stirring like a maniac to mix them up well with the masalas. Kit little bowls with the garnish and place in the centre of the table. Now take each piece of chicken out of the pan and, using two forks, shred it quickly. If the chicken is cooked, the chicken will simply fall off the bone. Get rid of the bone and return the chicken into the soup. At this point, stir through the tamarind paste. Don’t substitute the thighs with boring chicken breasts, to make sure you get full stock impact! I’ve made this with Turkey gravy and leftover shredded roast turkey too and it works out really well. Then pour in the coconut milk and leave to simmer, while you cook the noodles according to pack instructions.When the noodles are done, put the soup pan and the noodles on the table so guests can help themselves. Sprinkle liberally with the garnish ingredients. Serve your Khao Suey with plenty of napkins, coz it will get messy. Hay fever started for you already! I am dreading March now, hopefully I won’t get any worse this year than last year. Mallika, I went to Chiang Mai too – but didn’t see this or look for it. We had a lot of the local specialities and a Khan Toke dinner. Did you try that? My friend’s mom, who was raised in Burma, made this for us when we were in college. Hilarious – I’m chortling at my desk 🙂 The Sway looks very zen! Yum….looks good. Sorry to hear your recovery from vacation has occured! this looks like a bowl of happiness. 🙂 did you use chicken stock or water to make the soup? Looks delicious, will have to try it soon. This is such a wonderful recipe! I make it with mushrooms instead of chicken and it’s fabulous. I’m thinking of trying it with kathal (the chicken that grows on trees) as soon as it comes in season. I just tried this in Mumbai this time in Lemon Grass restaurant and loved it so much that I kept going back every night for dinner there. Thank you for sharing the recipe, will try it out! i was curious of the eggs being mashed why does it have 2 b like that? Finally, got what I was looking for!! Thanks. This looks delicious. What do we do with the lentils?